Alright, I know this is counter intuitive to my previous post. While I'm living out my summer dreams, I'm still responsible for getting the eldest child ready for the impending school year. Summer always ends too quickly, but we won't let the school year sneak up on us this time. We have a plan to make the beginning of the year exciting and less stressful. The first item on the list will be clothing. I go through the drawers and closets to see what still fits and what I need to buy. While I'm in the organizing mood, the dresser and closet will get a desperately needed sorting. After all of the clothes have been divided into keep and toss (if they can't be passed to little brother), I will add the needed articles of clothing to the school supply list. Shopping for school supplies isn't for the faint of heart. You are a true super hero if you can leave the store with everything you need in one trip. I spotted school supplies at the dollar store. Yay! At the end of the last school year, my son brought home left over school supplies. I will compare the list for this year and see what can be reused for the upcoming school year. The pencil box, scissors, lunch box, and backpack will be used again. After sorting all of the school supplies, I will print out coupons to take with me to the store. The list and coupons will be waiting in my purse for the next time I head out to the store. Wish me luck! Packing lunches everyday is not my favorite thing. I don't know of any parent who loves this part of school starting again. The good news is that I plan on reducing the stress by organizing the pantry. 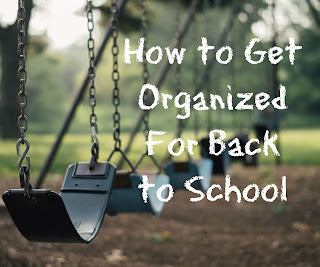 Stocking up on the every day essentials and keeping them organized will be an awesome start to the school year. If you are the crafty kind, then start now on the teacher gift. If not, then buy a gift card before school starts. You can buy the teacher gift while you are buying the school supplies and cloths. Getting all of the school shopping done in one day is possible if you plan ahead. Last year we moved right before school started, and I didn't get anything on the calendar. This year will be very different. I will sit down, put every date on my calendar. Hello, organization. I keep saying that word, but it is the keep to planning head. The first day of school is exciting. While we are still living out our summer fun, we are also looking forward to the next season of the year. What's on your to do list before the kiddos head back to school?